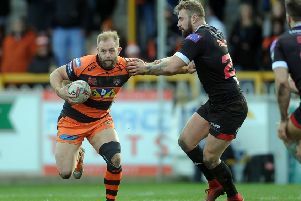 CASTLEFORD TIGERS’ matchwinner Liam Finn revealed he thought team-mate Luke Gale had already secured victory before his own composed drop goal ruined Warrington Wolves. Stand-off Finn slotted a one-pointer with just 108 seconds remaining of Thursday’s Super 8s tie to secure a 17-16 win that keeps them firmly in the top-four reckoning. Castleford had been 16-6 ahead only to see their rivals fight back with two tries in the final 11 minutes. Wolves’ equalising try came moments after Tigers’ scrum-half Gale had missed with a drop goal attempt himself – only ruled out by video referees James Child and Warren Turley. Finn admitted. “I was running back thinking it had gone over – but Galey said he’d missed it. “Luckily we got another chance and we are right in the hunt for fourth. “That’s the target – to get in the play-offs so we are one game away from the Grand Final. Finn, 31, actually scored the winning drop goal with his weaker left foot, the second time he has done that this season after producing a similar trick to defeat Leeds Rhinos at Headingley. However, if they are to become serious title contenders like Leeds, the Ireland international insists they have to play smarter. “We could have controlled the ball a bit better,” said Finn, whose misdirected kick led to Richie Myler racing 90m for the first of Warrington’s two late tries. Nevertheless, having been defeated 44-6 at home by Warrington less than three weeks earlier, there was an obvious improvement. “Defensively I thought we went up a level,” added Finn, with Castleford head to Catalans next in a week. We went after Warrington, who embarrassed us a few weeks ago.